Edmund Phelps with Marc Vignaud from Le Point discussing La Prospérité de Masse. June 2, 2017. Edmund Phelps promoting La Prospérité de Masse on TV5 / 64' Le Monde en français. Watch the segment here by scrolling down and clicking on "Le Grand Angle," the interview starts at 9:57: Link . May 31, 2017. Edmund Phelps gave a Seminar, “An Underlying Sickness in the West: Societies Failing their Economies,” at the OECD, Paris, France, May 31, 2017. Edmund Phelps attended Global Solutions' Think 20 Summit in Berlin where he spoke on the following topics: "Dealing with Labor Market Challenges in the Digital Economy" and "Economic Resilience -- How the G20 Can Combat Populism and Protectionism." May 29-30, 2017. Edmund Phelps interviewed by Mònica Terribas at RBA in Barcelona to promote Una Prosperidad Inaudita. May 22, 2017. Edmund Phelps promoting the Spanish edition of Mass Flourishing (Una Prosperidad Inaudita, RBA) on Catalunya Radio with Mònica Terribas. Listen here. May 18, 2017. Edmund Phelps signing copies of Mass Flourishing in Beijing. March 23, 2017. Joseph Stiglitz, Michael Spence, Christ Pisarides and Edmund Phelps interviewing with CGTN. 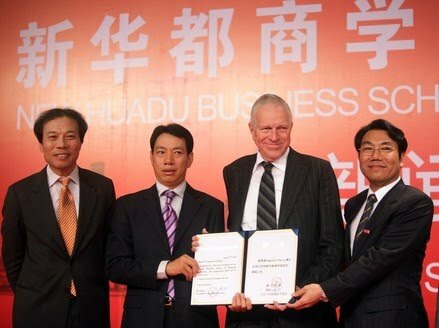 Edmund Phelps pictured with reporter Chen Zheng from Sina Finance after an interview. Jan Svejnar, Jack Lew, Edmund Phelps, Dr. Jiang Bo, Joseph Stiglitz, Zach He. Edmund Phelps spoke on the morning panel session "America First: Outlook and Global Impacts," alongside David Daokui Li, Doug DeVos, Niall Ferguson, Hugo Shong at the China Development Forum, Beijing. Pictured above is Edmund Phelps with other forum speakers, Joseph Stiglitz, Eric Maskin, and Chris Pisarides at the China Development Forum, Beijing. Edmund Phelps with Jack Lew and Larry Summers at the China Development Forum, Beijing. México Incluyente Conference, The Aspen Institute, Mexico City, Mexico, February 23, 2017. “Nobels on Where Is the World Economy Headed?,” Panel, Annual Meeting of the American Economic Assn., Chicago, Illinois, January 6, 2017. Recipients: Cordovan Magali Mancini and Constanza Bacigalupi of Vitalo and Gonzalo Tanoira of Citrícola San Miguel. December 1, 2016.
the 2015 recipient of the Phelps Medal for Innovation, "La Medalla Phelps par la innovacion." receiving a certificate naming him "Huésped de Honor de la Ciudad"
or Guest of Honor of the city of Buenos Aires. International Affairs Building, Columbia University, New York, NY. November 18, 2016. Edmund Phelps participates in panel discussion, "Unlocking the Potential of Europe"
Société Generale’s U.S. Headquarters, New York, NY. Panelists in Session Four, "Reclaiming the Role of the Individual"
Edmund Phelps participates in the Being Young Forum: From Silicon Valley to Zhongguancun: Who Will Be More Innovative, Young People in the U.S. or China? "Dynamism and Innovation in the West: Has a Decline Set In?" Edmund Phelps on the panel "New Materials and Energies"
Edmund Phelps and Mark C. Taylor at a one-day seminar in honor of Soren Kierkegaard's 200th birthday: "The individual - action - media - anxiety." The audience during the morning session at a one-day seminar in honor of Soren Kierkegaard's 200th birthday: "The individual - action - media - anxiety." Mark C. Taylor in conversation with Daniel Libeskind at a one-day seminar in honor of Soren Kierkegaard's 200th birthday: "The individual - action - media - anxiety." Edmund Phelps on the panels "Governments vs. Markets"
Edmund Phelps delivers a speech, "Growth, Exchange, and Investment Flows"
Edmund Phelps on the afternoon round table, "After Corporatism"
to the Russian Academy of Sciences, receiving an honorary diploma and pin. 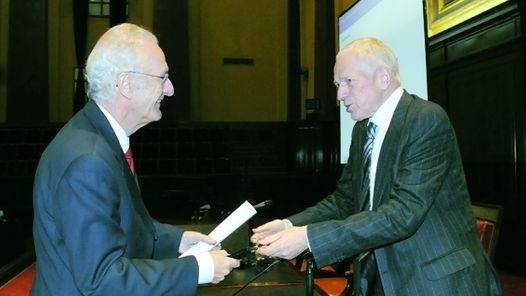 with Alexander Nekipelov, Vice-President of the RAS. At Tsinghua University, speaking with Professor Yingyi Qian. Professor Phelps delivers the keynote speech, "Creativity and Dynamism"
Professor Phelps is interviewed after his speech. "Philosophical Foundations of Economics and the Good Economy"
at Universidad de Buenos Aires. Edmund Phelps delivering his lecture, "Capitalism and Socialism,"